My wife is the baker in the family, the meticulous one who follows directions to the T, who doesn’t eyeball ingredients nor poke and prod before something is finished. I, on the other hand, am the one who fusses and goes by gut feel, which is why I’ve been garbage at baking. But that has changed somewhat, and for the 23,582th time in my life, I have my wife to thank. She has instilled patience and in placing trust in the process. She’s the one who convinced me when stirring chopped onions in the skillet, I can just let it sauté and not shuffle it around with a spatula non-stop like a manic. She’s also the reason I enjoy baking cookies now. 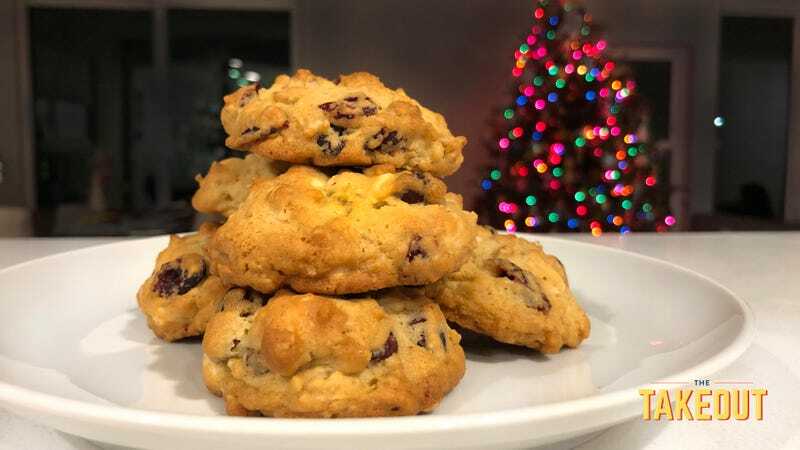 The first time she made cranberry oatmeal chocolate chunk cookies, I was blown away—tart, chocolatey, not overly sweet, thick and buttery. Turns out, she had gotten the recipe from the back of a Craisins package. It was because the recipe was so readily available, the barrier for cookie baking entry seemed less intimidating. So I tried my hand at making these cookies—following step-by-step directions like a big boy—and by god if I didn’t come off thinking I was Martha Stewart. They were so tasty that for three years straight I gifted them to my office colleagues—stacked six high in a plastic bag, wrapped with tinsel. Short of cash, I can’t think of a more crowd-pleasing holiday gift. This recipe is Ocean Spray’s, with one important difference. Their recipe calls for dropping rounded teaspoons of cookie dough on the baking sheet and baking for 10-12 minutes. The few times we did this, they came out nearly burnt (and yes, our oven temperature is calibrated). So we suggest doing this with rounded tablespoons, and bake closer to 10 minutes. Preheat oven to 375 degrees Fahrenheit. In a stand mixer or with an electric hand mixer, beat butter and sugar in a bowl until light and fluffy. Add eggs, mix well. Combine oats, flour, baking soda, salt in a separate bowl, then add to butter mixture slowly, mixing well. Add in dried cranberries and chocolate chunks. Use tablespoon to form dough into spheres, and drop onto ungreased cookie sheet. Bake about 10 minutes or until golden brown, and cool on wire rack before serving. Was the chocolate chip cookie dumb luck or Nobel-level genius?